Valerian (Valeriana officinalis) is a perennial herb growing to about 1 meter tall. The plant is found in most parts of the United Kingdom (figure 1). 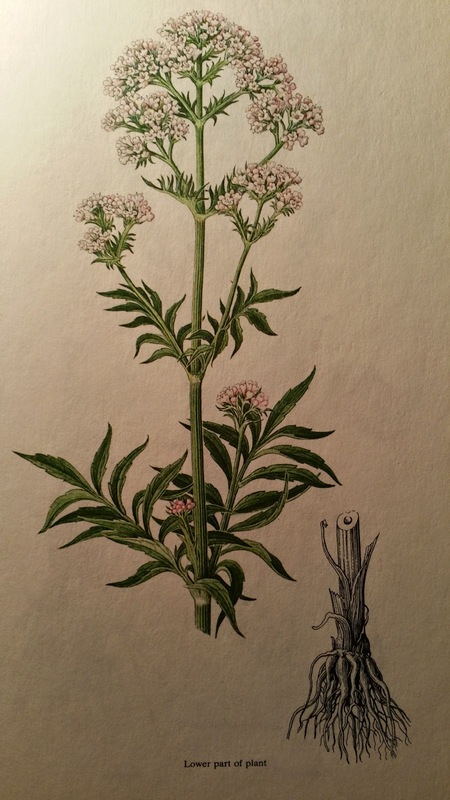 Other species of of valerian include Valeriana jatamansi (Indian valerian) and Valeriana edulis (Mexican valerian). The leaves of the valerian plant are toothed and the flowers are small and pinkish or white clusters that bloom in the summer months. Valerian has a short rhizome but an extensive root system and it is this part of the plant that is particularly interesting nutritionally. The plant is grown commercially in some countries for its medicinal root, which has been used since medieval times as a sedative. In this regard valerian is an effective hypnotic and is often recommended for those who find difficulty sleeping. Valerian, because of its calmative effects, may also be useful to those with mild anxiety, and can be used in the treatment of muscle spasms and cramps. The root system is the location of the active ingredients in valerian that give it its hypnotic effects. In this regard a number of substances are thought to contribute to its effects including volatile oils such as monoterpenes, sesquiterpenes (e.g. valerenic acid) and valerenyl esters; iridoids (valepotriates) such as valerate, dihydrovalerate and valerosidate; alkaloids such as actinidine, chatidine, skyanthine, valerianine, and valerine; phenylpropanoids such as chlorogenic acid and caffeic acid; and amino acids such as gamma-aminobutyric acid (GABA). However, the exact agents and their effects in animals have yet to be fully characterised. The hypnotic effects could be accounted for by the presence of the amino acid GABA, as the valerian plant is thought to exert its effects through the GABA receptor in the central nervous system. However, other constituents may also play a role in this regard. Is Hydroxycitric Acid Useful in Weight Loss? What Should You Do If You Catch A Cold? When is A Vitamin Not A Vitamin?